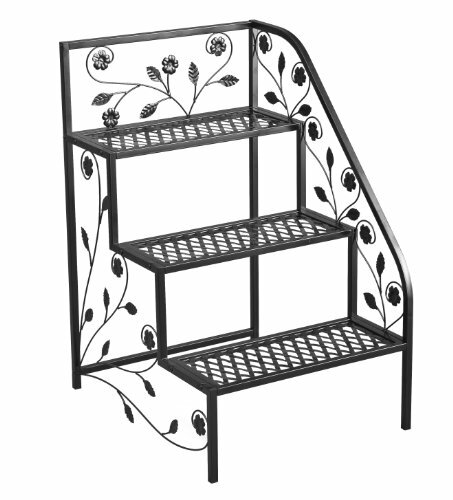 Tierra Garden 39-100362R 3-Tier Right Corner Plant Stand, 19.5 by 23.5 by 31.5-Inch, Black by Tierra Garden at Tulips Orchids. MPN: 39-100362R. Hurry! Limited time offer. Offer valid only while supplies last. Three tier Indoor/Outdoor Plant Stand is so versatile! It can be used alone or combined with coordinating left plant stand to work for any area. Three tier Indoor/Outdoor Plant Stand is so versatile! It can be used alone or combined with coordinating left plant stand to work for any area. Striking flora leaf design provides a perfect backdrop to showcase your beautiful plants. Sturdy tubular steel construction with black powder coat finish. Great for your entryway, porch, patio or deck. Assembly instructions included. Measures 19.5-Inch Wide x 23.5-Inch Deep x 31.5-Inch High. Tierra Garden is an importer, designer and manufacturer of distinctive garden products that has developed a reputation for quality products and a broad selection of unique garden hard goods.